New Paranormal YA coming soon. Deals with social and environmental issues. 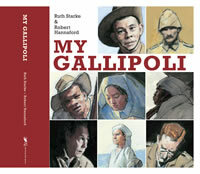 With the 100th anniversary of the Gallipoli campaign happening this weekend, My Gallipoli is a must read for children and students everywhere to help understand what it must have been like during those terrible times of World War One. The author has woven very skillfully all the different points of view. We see what it was like to be a Turk defending their homeland. We see the Australian and New Zealand soldiers arriving ready to fight, but totally unprepared for the reality of war. We are drawn in to the life of a nurse caring for wounded and dying soldiers and even a chaplain who laments that there are “too many bodies to give them proper burials”. There are many more stories shared in this sophisticated picture book and the illustrator has captured those moments and the landscape perfectly with his mixed media illustrations. This is a powerful book, in that by allowing us to see so many sides of the war at Gallipoli, we can’t help but realize how futile it all was and the huge cost of such a war. At the back of the book there are three pages of biographical notes with further information on each of the characters portrayed. This is a beautifully produced book aimed at school students but its value goes beyond just use in a classroom. The accounts are poignant for all readers. What I found most intriguing was that all were desperate to help their cause no matter what side they were on, and you can feel and connect with their frustration at what was happening all around them. A powerful book! I do urge you to read the teacher notes here if you want to make the most of this wonderful resource. I have been a huge fan of Anna Walker’s work for some time now. My favourite book so far is Peggy blogged about in a previous post. However, after checking out this new trailer for her latest book I may end up with two faves. I love the style of her illustrations. There is a softness to them that draws you in and connects you with the characters in her stories. “Bill is having a bad day. We all have days where we struggle just to cope and we all have days when we sometimes need a little reminder of how good things really are. I just know this book is going to be one of those good things. I will certainly be looking out for this one when it hits our shores in a few weeks. Check out the trailer and watch for Mr Huff’s smile when it comes after the tears. Just gorgeous!